Until now it has been complicated to measure tissue advanced glycation endproducts (AGEs) in patients as existing methods are expensive, time consuming, lack specificity, are poorly reproducible and/or are invasive. The AGE Reader is therefore the answer to the need for measuring AGEs without the disadvantages of the existing methods. 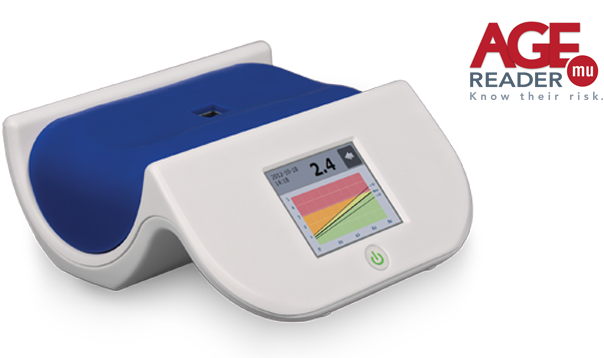 This state of art device provides a simple non-invasive solution, allowing clinicians to determine the AGE level within 12 seconds. Many AGEs have a characteristic fluorescence. Moreover, tissue fluorescence in invasive biopsies has an established association with chronic complications. The AGE Reader is able to easily, quickly and noninvasively measure this tissue fluorescence. The AGE Reader has a light source which illuminates the tissue of interest. This light excites fluorescent moieties in the tissue which will emit light with a different wavelength as a result. In the used wavelength band the major contribution in fluorescence comes from fluorescent AGEs. 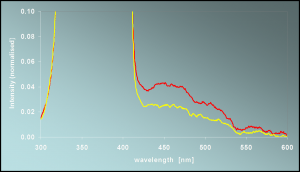 The emitted light is detected with the use of a spectrometer or photodiodes.